At Precision MicroFab, we’re at our best when we’re digging into a sticky problem. These case studies will give you an idea of our capabilities, but we encourage you to call us at 888-592-5589 to discuss your specific requirements. We may be able to invent a solution on the spot that you haven’t thought of yet! Laser welding metal with minimal oxidation and minimal heat affected zone (HAZ) outside the area of interest. Five by five blind micro-hole arrays drilled in a sapphire wafer using an ArF excimer laser. This hole array was created in stainless steel using an infrared laser. Micro-channels with hemispherical cross sections milled in polycarbonate. Sensors cut from 25 µm thick MetGlas.The struts are 75 µm wide. Plastic cell phone display welded using an infrared laser. The melt pool is 300 μm wide. A hole array drilled in 500 μm thick borosilicate glass using an ArF excimer laser. Examples of micro-devices designed and manufactured for the life sciences, microelectronics and aerospace industries. This micro-channel, laser milled into sapphire, is 90 µm deep by 75 µm wide. Precision MicroFab designs and builds turnkey laser systems for micro-machining and micro-welding. An array of holes laser drilled entirely through a 1.0 mm thick microscope slide. Using our proprietary micro-mill, we manufactured this polycarbonate nozzle with a conical entrance and exit. micro-mold of a micro-fluidic mixer suitable for high volume production by hot embossing and cast silicone methods. Micro-milling can be used for a variety of applications, including diode mounts and fiber optic arrays. 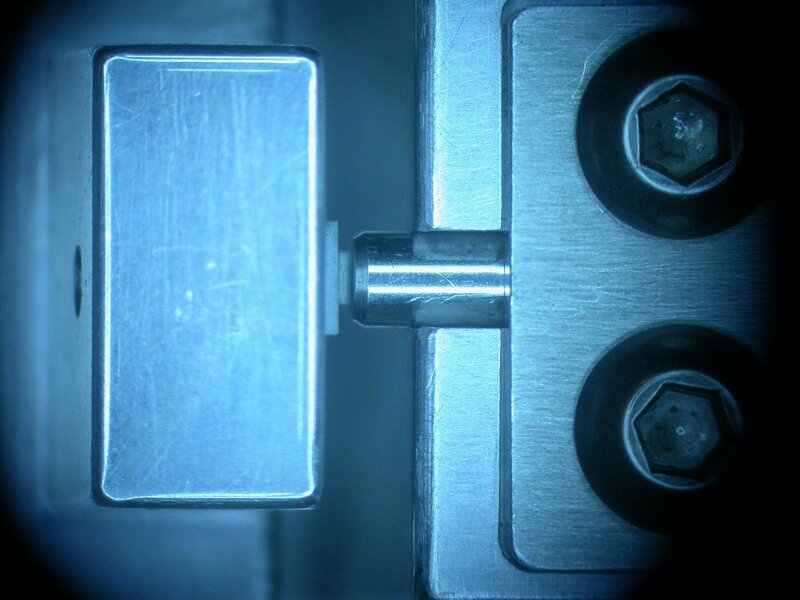 These probe tips needed to be tapered down to consistent 6 μm truncated pyramids with a tolerance of +/- 2 μm. We use lasers to micro-weld and micro-solder at a very small scale. 50 µm wide leads are laser soldered onto a thin metalized layer deposited on a ceramic substrate. We were contacted to design and micro-manufacturing a microfluidic nozzle for better ultrasound visualization. Using infrared fiber lasers, Precision MicroFab machines knife-edge quality, irregular shapes in silicon wafers. We were contacted by NASA to fabricate a better fiber optic ferrule which would be implemented on future planetary exploration missions.